New from Concord - watches C2 GraffitiGrey.Swiss watchmaker Concord again pleased its fans new wristwatch C2 GraffitiGrey (ref. 0320190). 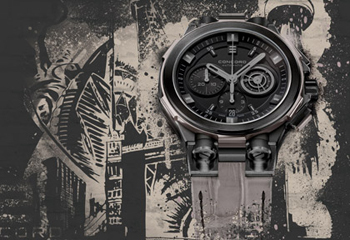 Swiss watchmaker Concord again pleased its fans new – wristwatch C2 GraffitiGrey (ref. 0320190). Being a part of the collection C2 Y-12, the new owner is an exclusive design and a new version of its highly successful predecessor C1. New C2 GraffitiGrey (ref. 0320190) is provided in housing with a diameter of 43 mm and a thickness of 12.75 mm stainless steel coated with PVD-coated black and decorated with inlays of gray. The face of the building is equipped with smoked sapphire crystal with anti-reflective coating thickness of 2 mm. Lively fluted crown with a monogram on the end of C is set to the 3 o’clock position and is surrounded by buttons chronograph function, also decorated with elegant decor gray. The bezel is fixed with 6 screws to the body, waterproof to 100 meters. The back cover is engraved inscription «audace – Savoir – Faire – Avant-Garde». The black dial is marked novelty hour indexes, covered with a luminescent substance Super-LumiNova ®. Time indexed by the central arrow hour and minute. Small second hand is located on a rotating disk in the 3 o’clock position. Chronograph functions are displayed on the 30-minute indicator at 9 o’clock position and 12-hour indicator at the 6 o’clock position, combined with a square aperture date, and with the central seconds hand. New C2 GraffitiGrey (ref. 0320190) operates on a mechanical caliber ETA Caliber 2894-2 Automatic. 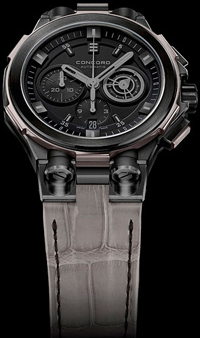 Calibre has a 42-hour power reserve and balance frequency 28,800 semi-oscillations per hour. A mechanism: display hours, minutes, seconds, date and chronograph. Completes the sophisticated design of the model C2 GraffitiGrey (ref. 0320190) alligator strap gray with black stitches with steel folding buckle with a monogram of Concord. Buy watches C2 GraffitiGrey (ref. 0320190) will be this fall at the company officials Concord.